January 8, 2013 was the 47th death anniversary of the master filmmaker Bimal Roy. 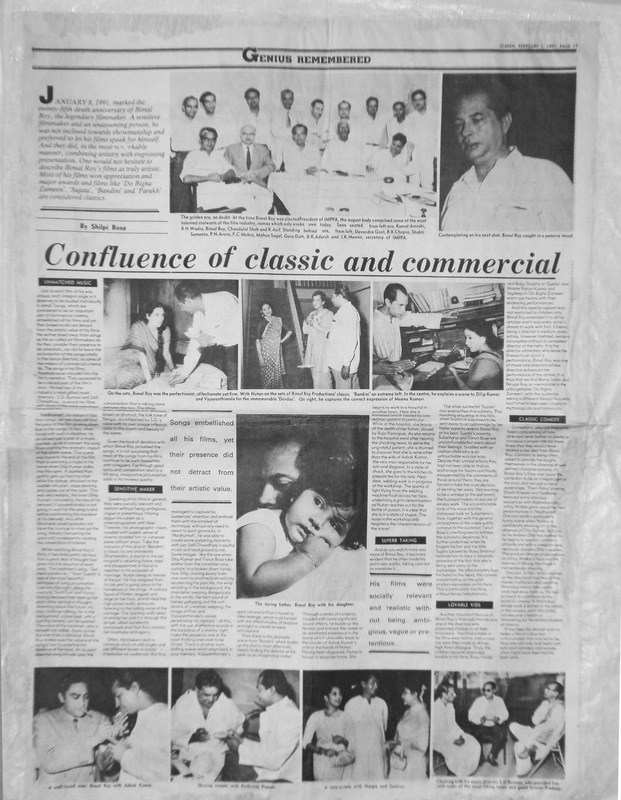 Way back in 1991 I wrote an article(it appeared in the film weekly Screen) to mark his 25th death anniversary.I had discussed Bimal Roy’s films in considerable detail. this photograph was taken by Mrs Monobina Roy (Mrs. Bimal Roy) who was herself an accomplished photographer. Mrs. Roy and members of Bimal Roy productions- who were still around then- called me up to show their appreciation. Despite all the appreciation, I remember feeling a little frustrated because I was unable to supplement my article with the relevant stills from the films I had discussed in the article. The article felt incomplete; however today thanks to modern technology I can do a better job with the help of screen caps and clips. Bimal Roy was a sensitive filmmaker, an unassuming person, a man of few words, a very affectionate man who did not indulge in showmanship. He preferred to let his films do the talking. His films were socially relevant without being pretentious. Most often than not commercially successful films are panned by the critics but that was not the case with Roy’s films, most of his films were successful and were also critically acclaimed for their artistic presentation. Bimal Roy began his film career as assistant cameraman at New Theatres. He later went on to become a cinematographer. Some of his noteworthy films as cinematographer at New Theatres were both the Hindi (starring K.L. Saigal) and Bengali (starring P.C.Barua) versions of Devdas .He took the film world by storm with his maiden directorial venture Udayer Pathey in Bengali and Humrahi its Hindi version. He later came to Bombay and set up Bimal Roy Productions. I always loved the Bimal Roy Productions logo. 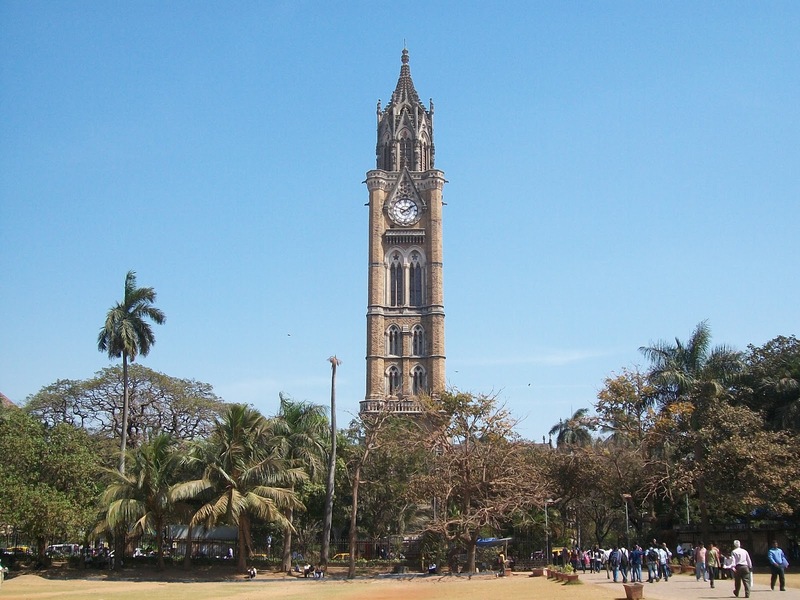 The choice of Rajabai Clock Tower is I think very apt, after all the film industry is located in Mumbai (Bombay) and I believe the tower perfectly symbolizes the city. In the picture below you see the tower, in the foreground is the Oval Maidan where youngsters play cricket and other outdoor games, in fact you can see former cricketer Dilip Vengaserkaar coaching little boys at this ground. 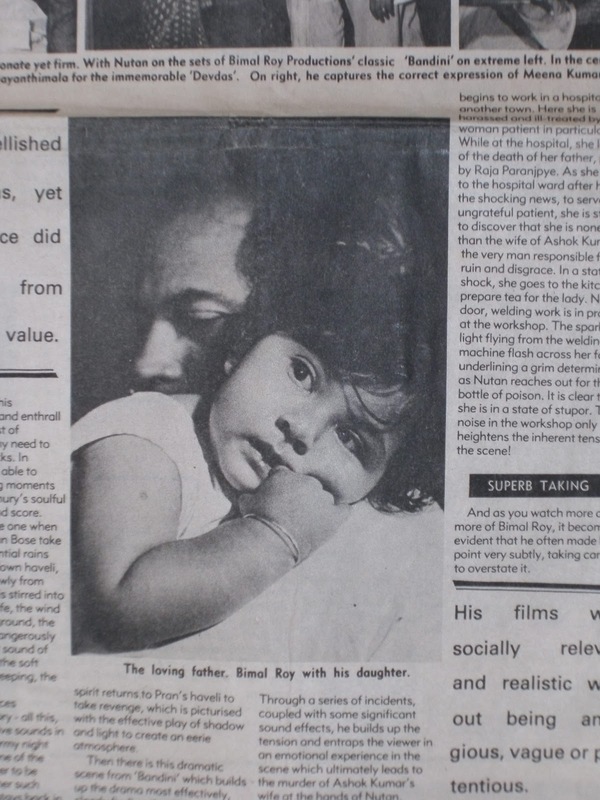 I was a little kid and therefore have a very faint memory of Bimal Roy but his memory was kept alive at home by constant discussions about him and his films. 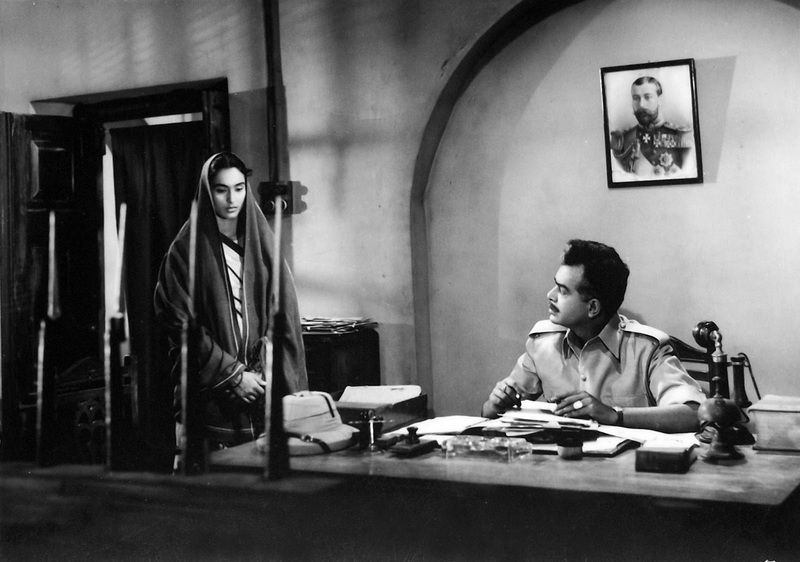 I have chosen Bandini for my first post on Bimal Roy because I feel this film serves as an excellent lesson in filmmaking for any student of cinema. But before I move on to the film, I would like to share some anecdotes from the film. Those of you who have read my guest posts for Memsaabstory may recall seeing the still below. That is my father with a very young Dharmendra in Bandini. This scene was obviously edited out for I never saw this scene in the film. I would like to share what Dharamendra told dad when both were new to the industry. At this time by no stretch of imagination could they be called rich. Dharmendra made a pact with my father while travelling with him in the local train; he requested my father to pay for his ticket while he would pay for his own and that neither he nor my father should bother to offer to buy the other's tickets, a courtesy which most people extend to a friend but in this case being short of money, such a courtesy would be strain on their limited funds. While on my father and Dharmendra, in the screen cap(below) from Bandini you see my father in layers of clothing. He is actually wearing a very heavy overcoat which Bimal Roy had purchased from Russia and is ideal for that country’s severe winter. The jail in this scene is supposed to be located in Allahabad and the season is winter hence the need for that heavy overcoat, the only problem , they were not shooting in Allahabad but at a set erected in hot and humid Mumbai or Bombay as it was known then. In this scene my father asks Dharmendra -- who plays a doctor – to hurry up, for he (my father) may land up in hospital if he has to wait for too long in the cold. What was most amusing was while my father was delivering this dialogue about the cold, Roy noticed sweat trickling down my father’s face, he immediately called, “Cut”, and instructed someone to wipe the sweat off his face – well who said acting was easy? To watch this scene, click here. You will see it approximately at 2:24. Another anecdote that I heard from the people connected to Bandini was about the scene below. Here you see Ashok Kumar relishing some halwa, unfortunately for Ashok Kumar, the unit member who organized the halwa did not check the halwa’s quality- the halwa had gone stale. This reminds me of a similar experience my father had while shooting a wedding sequence for Jyot Jale. He played an alcoholic in this film, his wife Nirupa Roy throws him out of the house. Once out of the house and without a job, hungry and completely shattered, he (my father) gate crashes a wedding and hungrily stuffs some puris in his mouth. For some reason (I do not remember why) we were there at the shooting and I remember seeing dad spitting out the puris the moment the shot was over, he said the puris were absolutely stale. In the screen cap below you see my father reading, there is a close-up of his hands and you can see his favourite ring. It had a small kukri, later the kukri fell off and my father exchanged the ring for another one. Hope you enjoyed these bits of trivia. Having finished with the trivia I will move on to the film in my next post. No, it will not be a review; I leave that to the experts. What is it going to be? Well, watch this space while I pay some attention to my poor neglected food blog. Though Bandini was Nutan's movie throughout, I must admit, it was the scenes which had Dharmendra and Tarunji which I liked the most in the movie. I think their natural goodness did not make it necessary for them to 'act' at al. Of course, Bimalda's master direction only added to the effect, but those are the moments which still stand out for me. I really adore the scene where Tarunji tells Nutan about the doctor being the ideal groom for her and that he stands guarantee about him. Speaks volumes.....thanks for refreshing my memories, Shilpiji. Yes it was Nutan's film and she was superb. 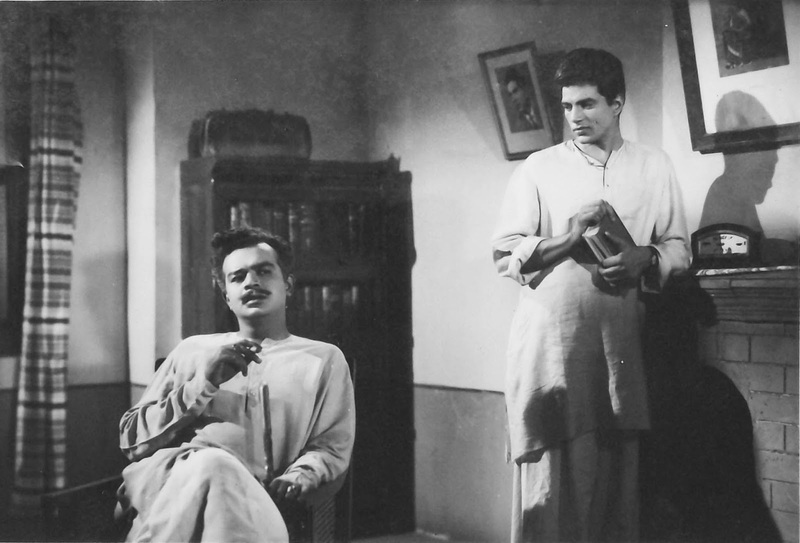 Bandini is one of my favourite film, just as Bimal Roy is one of my favourite directors, possibly THE favourite one. One thing I've found about Bimal Roy's movies is that he seemed to get the best out of every actor. Maybe that's partly because the actors felt totally immersed in their roles. How right you are Raja,you have made the right observation about Bimal Roy and my next post will more or less highlight this point. thanks for inviting us to be a part of the magical oldies. Welcome rangoli, glag you enjoyed the magic of the oldies. Poor Tarunji, had to wear the heavy coat in Bombay humid heat! There the role demanded, but I don't understand why so many heroes and villains go about wearing a leather jacket and what not in Hindi films set in Bombay. Like for many people here, Bimal Roy is also a fav director of mine. Fell in love with his films, when they were broadcast on DD. I must have been 12 or so, when they were shown in a series of four films under the title "Atith Ke Jharokon Se". The films that were shown were Do Bhigha Zameen, Sujata, Madhumati, Bandini and Parakh. I couldn't see the last film because of electricity failure at our place and I was very sad that day. Actually Harvey I started off thinking I will finish Bandini in one post and then I found myself adding one anecdote after the other. My brother too added his bit, he told me about the overcoat, I knew then this had to go into 2 parts. Dear Shilpi, you don't have by any chance a high resolution photograph of that article in Screen, do you? Or is the article available online? No Harvey this is a very old article I don't think they have these online. I will get my brother to use a better camera, you see I do not have a scanner, never got down to buying one. My brother says usually the edges get blurred but what can be done is he can photograph them in parts and send it to you. You have my email id from the comments I post so please send me your email id and I will try to send you the photos as soon as you can. Thanks a million Harvey for the link, that was quite interesting, I wish my parents were around I would ask them whether they knew about these differences. Wow. This was some post Shilpi. I hope you have many many more such stories for us. I want to see Bandini now :) once again. Somehow your post reminds me of Guddi. It was full of such meta references. Glad you enjoyed it Ava, yes I have quite a bagful of anecdotes, just wait and watch. What a lovely set of anecdotes, Shilpi. So much fun to hear about people you have only read about so far in impersonal reams of newsprint. Somehow it is so different when it is narrated by someone who actually knew the people (or of them)and these instances. Thank you so much for this. Eagerly awaiting your post on Bimal Roy and Bandini. You know Anu, had mum been around she would have given me tonnes of such anecdotes now my brother and I are just digging deep into our memory to unearth all this trivia. Amazing Anecdotes, LOVED IT. As viewers we just never know what goes in behind the scenes. Acting sure is not an easy profession. Looking forward to the next part. Glad you loved it, hope you continue to enjoy my future posts. Sorry Madhu that reply got published when all I had done was typed the letter Y, I tell you my laptop has a mind of its own, so I had to remove it. So, I was saying that, you know I did not know that photograph was taken by Mrs Roy, though I did know that she was an accomplished photograph. There are some very lovely photos of Bimal Roy taken by her. The family obviously have a huge collection. I came to know about it when Mrs Roy called me up soon after the article was published and told me that this particular photograph was taken by her. Tarun Bose used to totally get into the caharcters that he would play. That made the charatcters to meaningfully add the value to the narrative. This would be a great help to the Director, who does have a very definite reason for bringing in the character, becuase such charcters bring out the nuances of the narrative's environment. 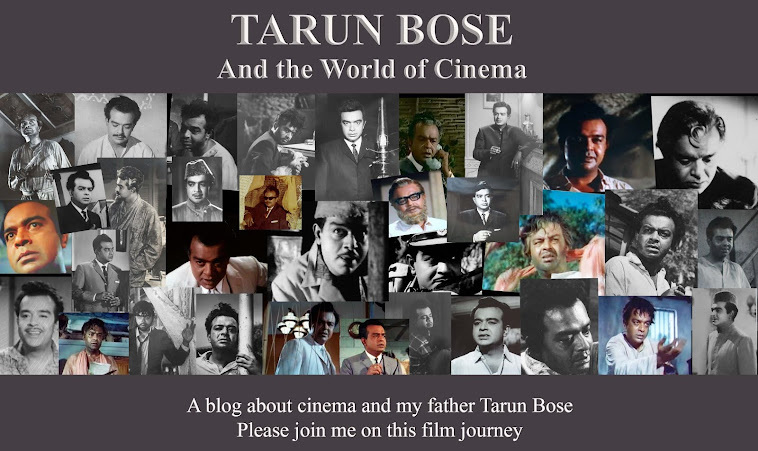 We are fortunate to get an intimate, informal ring-side view of the events around Tarun Bose through these articles. Yes you are right about him getting immersed in his roles, and how immersed I will talk about it in my future posts. Look forward to the next part of this narrative. Would appreciate if you have anything relating to filming of Mat Ro Mata Lal Tere Bahu Tere. Unfortunately my mother has taken away all the memories with her. Had she been around she would have filled in the gaps. I do not have any matter on this particular song. However there are other memories and other films so just wait and watch. I appreciate your choice of Bimal Roy and Bandini to start off, Shilpi. One sees your father beginning to wipe his face as the scene cuts. The khukri ring looks fascinating. Very unfortunate that the khukri fell off. > What is it going to be? Well, watch this space while I pay some attention to my poor neglected food blog. Actually he is not wiping his face, he is about to blow his nose to indicate that he is already suffering from a cold. Yes I guess you are right about the 'oss' bit then you know what I would do if I were the dialogue writer I would write,"Thanks to the dew, see moisture is trickling down my face" Now that would be innovative don't you think? I am a little scared I seem to have raised everybody's expectation hope you guys like the next post, but I will take a little time once again. Thanks Ash, this is the best part about the internet.I feel empowered, I do not have to beg any publisher. Interesting read. Found the bit about the halwa and the puri quite amusing. Glad you liked it Nivedita. So glad you are enjoying it.